Professional wrestling has been criticized for its emphasis on the fiction of its entertainment rather than the reality of its sport. My partner, Christopher Olson (Seems Obvious to Me), and I argue that professional wrestling functions as a convergent media product, representing a vital text for examining the media landscape of the 21st century. The true nature of professional wrestling is in how it combines fiction with reality; it exists at the intersection of different identities, realities and conventions, which can seem oppositional to one another. When examined through the convergence of different identities, realities, and conventions, the true dialectical nature of professional wrestling emerges. Professional wrestling succeeds because of its ability to converge these different factors into a coherent post-modern and polysemic text with which an international polyvalent audience can identify and engage. This post will deconstruct this nature of professional wrestling by considering the various factors that are converging to construct the texts, practices and experiences of sports entertainment. First proposed by Henry Jenkins, the concept of convergence represents one of the most pervasive buzzwords in media studies, but with good reason. In essence, convergence concerns how the boundaries between different technologies, practices, and ideas blur together to create something new. This becomes important when considering that the current media landscape consists primarily of convergent texts and technologies. For instance, the smartphone functions as a prime example of this phenomenon, because it is a convergent technology that combines the telephone, the computer, the global positioning system, the television, the music player, and other technologies into one device. This confluence of technologies results in the creation of a completely new technology that in turn results in new forms of engagement. Professional wrestling can and should be examined through the theoretical lens of convergence. As mentioned, professional wrestling (a.k.a. sports entertainment) has long been criticized for being more fake than real. Academic scrutiny tends to focuses on this aspect, as well as the potentially racist, misogynist, and jingoist messages frequently conveyed via sports entertainment programming. In addition to these analyses, we argue that professional wrestling functions as a prime example of convergent media, and therefore becomes a vital text within the context of the overall media ecology of the 21st century. Rather than deride so-called “sports entertainment” for walking a blurred line between authenticity and artifice, we believe professional wrestling’s importance lies precisely in how it combines fiction with reality. In all aspects, professional wrestling exists at the intersection of a variety of identities, realities and practices, some of which initially appear oppositional to one another. The stories presented combine a number of different genres, including drama, action, comedy, horror, science fiction, and even romance. The business practices exist at the intersection of fan-centric and bottoms-up strategies, but also demonstrate a strict top-down corporate control. The wrestlers themselves combine aspects of carnival hucksters, actors/actresses, comedians, superheroes, martial artists, stuntmen, and more. The narratives frequently consist of everything from social critique to geopolitical allegories, and soap opera melodramas to exploitation. These are just some of the ways sports entertainment reflects the concept of convergence. This blog post will focus on the analysis of the rhetorical nature of professional wrestling to understand what genres, identities, and practices are converging to produce the characters, matches, and shows of sports entertainment. Subsequent posts will include presentations from conference panels to indicate how other academics have been approaching this understanding of professional wrestling as a convergent text. The information provided below was presented by myself at the 2015 Central States Communication Association, and by Chris at the 2015 Midwest Popular Culture Association. The nature of professional wrestling is convergence. Convergence represents a primary characteristic of what it means to be “sports entertainment”: the convergence is immediately apparent in that term. Sports are commonly interpreted as realistic; they occur in real-time, in physical locations, with real players, with real competitive goals that result in endings that have not been predetermined. Entertainment, however, is not necessarily realistic; indeed, the vast majority of texts, events, and activities that could be labeled as entertainment tend to have been manufactured with predetermined beginnings, middles and ends and populated with individuals who may bear little resemblance to any real person, living or dead. Hence, sports are real, and entertainment is fake. Professional wrestling converges these two notions together, merging the fictional and the realistic in the production of its characters, matches, and shows. A long-standing criticism of professional wrestling is that it is all fake: the wrestlers are actors playing roles, the matches are predetermined, and the shows are (supposed to be) carefully constructed narratives meant to advance the stories about the characters that are told through promos and the matches. Characters, matches, and shows are not meant to break “kayfabe.” Kayfabe invokes the idea that the portrayal of of the staged events within the industry is to be interpreted as “real” or “true.” Specifically competition, rivalries, and relationships between wrestlers is to be understood by the wrestlers and wrestling fans as genuine and not of a staged or pre-determined nature. The term has evolved to become a code word of sorts for maintaining this “reality” within the realm of the general public. Wrestlers are supposed to be their performances when engaging with the “real world” so as not to break the illusion (co)constructed by kayfabe. Kayfabe, then, is meant to be a suspension of disbelief. The term was coined in 1817 by the poet and aesthetic philosopher Samuel Taylor Coleridge. The term suggested that if a writer could infuse a “human interest and a semblance of truth” into a fantastic tale, the reader would suspend judgment concerning the implausibility of the narrative. The term is often applied to fictional works of action, comedy, fantasy, and horror. Not all authors believe that suspension of the disbelief adequately characterizes the audience’s relationship to imaginative works of art. J. R. R. Tolkien challenges this concept in his essay “On Fairy-Stories”, arguing that for the narrative to work, the reader must believe that what he reads is true within the secondary reality of the fictional world. By focusing on creating an internally consistent fictional world, the author makes secondary belief possible. Tolkien argues that suspension of disbelief is only necessary when the work has failed to create secondary belief. From that point the spell is broken, and the reader ceases to be immersed in the story and must make a conscious effort to suspend disbelief or else give up on it entirely. Kayfabe is co-constructed. It requires the wrestling fans to agree that what they see is “real;” it requires the fans to become so entangled in the character’s struggle or the story of the match or the narrative arc that they do not constantly question, and thus detach, from the kayfabe. In becoming so entangled, they co-construct with the text the hyperreality of the text. According to semiotics and postmodernism, hyperreality involves an inability of consciousness to distinguish reality from a simulation of reality, especially in technologically advanced postmodern societies. Here the inability is due to a lack of wanting to or because of how immersed they are in the text given emotional or cognitive investment (e.g. individuals may find themselves for different reasons, more in tune or involved with the hyperreal world and less with the physical real world). When this happens, the fan perceives reality and fiction seamlessly converging so that there is no clear distinction between where one ends and the other begins. Kayfabe is maintained, and the fictional becomes real. And yet, professional wrestling is very real. The wrestlers are real in that they have had to train, sometimes for their entire lives, to perform as they do. The matches are real in that the wrestlers (for the most part) are performing the moves and sometimes suffering debilitating injuries for doing so. Even the narratives sometimes are real, such as when wrestlers have had serious grudges with one another that were not just kayfabe. And then there are the moments when wrestlers have broken kayfabe for some personal reason, such as C.M. Punk’s famous pipe bomb speech (seen above), or the hug among enemies between Triple H, Shawn Michaels, Razor Ramon and Diesel (seen below). Wrestling fans, for the most part, did not reject these truly real moments because of the personal and emotional heft of the moments and the investment the fans had put in these wrestlers. Getting to know the real person behind the kayfabe performance is another way to maintain that entanglement, the continue the co-construction of the hyperreality that is sports entertainment. Fans can be transported and immersed into professional wrestling in a variety of ways, such as: buying into the kayfabe, making connections with the wrestlers or the stories being told, or seeing in the wrestling something they recognize and love elsewhere. It is on this latter possibility that this post now focuses: how professional wrestling as a text features the convergences and blurring of lines between wrestling and other aspects of pop culture. Professional wrestling borrows from and informs other pop culture genres and platforms, demonstrating an ability to converge not only “sports” and “entertainment” but to converge the notion of sports with specific subsets of entertainment. That is to say, professional wrestling characters, matches, and stories will reference other pop cultural texts so as to be more approachable to a larger audience. At the same time, those aspects of professional wrestling have informed other pop cultural texts, suggesting that the relationship between professional wrestling and the rest of pop culture is a fluid, dynamic and interactive relationship. This section will consider two primary ways in which this relationship occurs. First, there appears to be a great deal of convergence between professional wrestling and motion pictures. At various times through professional wrestling — from the large feds to the indies — the lines have been blurred, almost to the point of copyright infringement, as wrestlers and shows have appropriated genre tropes, movie characters, and even movie genres into their matches. In the WWE, this can be seen in the number of wrestlers referencing the Mad Max film franchise, and in particular The Road Warrior (1981). 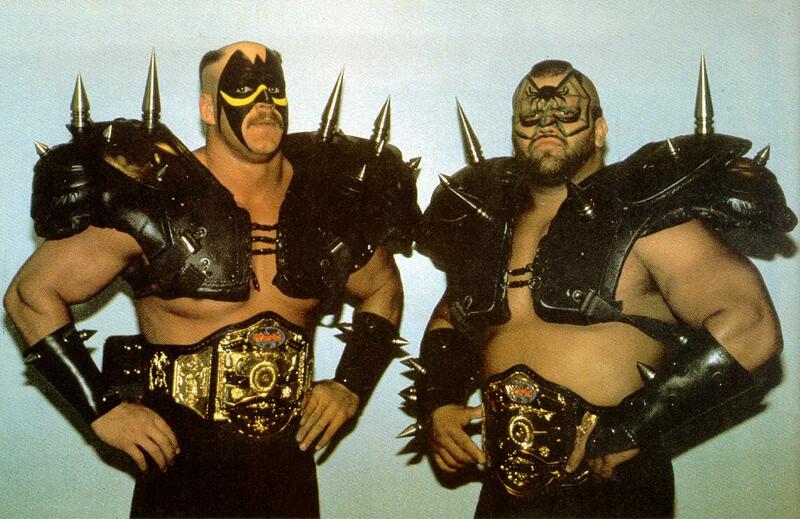 For example, the classic tag team The Road Warriors, Animal and Hawk (seen above), present themselves as if coming from this post-apocalyptic land. 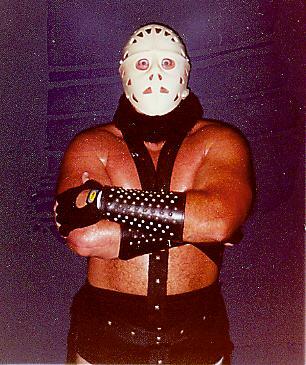 At the same time, several different men “played” the Lord Humongous wrestling character (seen below, embodied by Sid Vicious), a direct take on The Humungus from The Road Warrior. 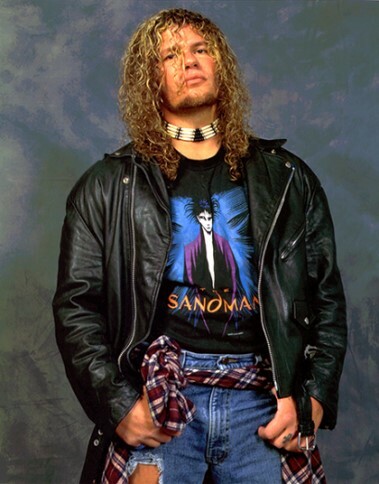 Chris Jericho has referred to himself as the “The Ayatollah of Rock and Rolla,” a moniker given in the film to describe The Humungus. The references to this film series also appear to align with the subset of wrestling that references heavy metal music and aesthetics. But many other movies and movie genres have influenced professional wrestling over the years. 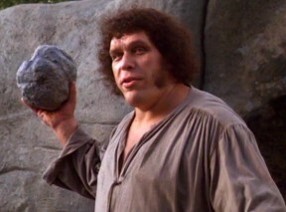 From Westerns to science fiction, from pornos to horror films, many different wrestlers have adopted personas that draw on various genre tropes or make direct references to specific films. Booker T’s catchphrase “Can you dig it, sucka?” references The Warriors (1979) while the Vaudevillains’ entire performance references the bygone era of silent films. Of course, it is not just the WWE or its absorbed federations that have wrestlers engaging in such convergence. 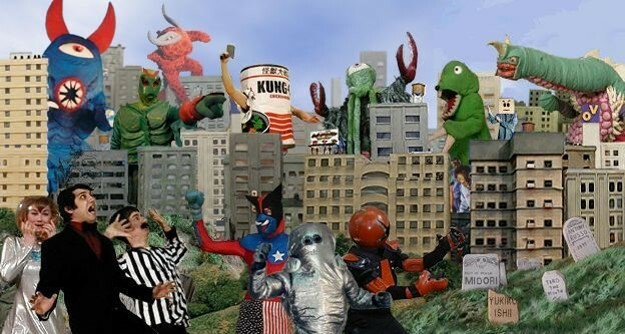 Kaiju Big Battel was built on the influence of Japanese kaiju stories, where larger-than-life heroes take on tremendous monsters, all with, at times, a 1950s US sci-fi B-movie schtick. Sometimes what the wrestling federation adopts is less specific characters or genre tropes, and more the aesthetics of films in their storytelling. For example, the recent emergence of Lucha Underground presents an interesting case. Airing on the El Rey cable network, the show primarily serves as a showcase for Mexican lucha libre style wrestling. However, the show is produced by filmmaker Robert Rodriguez (El Mariachi, Spy Kids), who also started the cable network. The wrestling show will contain promos and vignettes produced with the quality of a motion picture, and will at times reference other motion pictures, such as the scene represented below that appears to draw on Quentin Tarantino’s Kill Bill series (Tarantino being a frequent collaborator with Rodriguez). All of this discussion thus far has focused on the appropriation moving from the movies and into wrestling, but of course this relationship has moved in the other direction over the years. 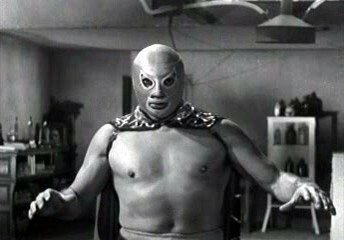 Indeed, specific to Mexican wrestling, there have been numerous lucha libre films over the decades, such as those featuring the famous wrestler El Santo battling creatures of the night. And the WWE has produced wrestlers that became movie stars, from Andre the Giant and Roddy Piper to The Rock and Bautista. (I leave out Hulk Hogan as He Who Must Not Be Named right now in WWE history). These wrestlers have had an enormous impact on professional wrestling by helping to bring the fans of their movies into sports entertainment. But especially when they are in action films, these wrestlers are able to bring the moves they do in the squared circle to the limelight of Hollywood, and have been able to change the type of action seen in movies. For example, consider the presence of the Rattlesnake, Stone Cold Steve Austin, in The Expendables (2010) for how his interaction with Sylvester Stallone was impacted by the incorporation of wrestling moves into the fight scene. As more wrestlers make movies — and as the WWE continues to expand its synergistic business practices to create more movies (something to discuss in another post) — then there will be more impact on how movies like these are made, how their stories are told, and how the action is choreographed. The lines between professional wrestling and motion pictures will further blur and converge. Second, there appears to be a long-standing relationship between professional wrestling and comic books, especially superhero comic books. I have written on this topic elsewhere on this blog, but the main thing to point out is how the same type of two-way relationship described above also occurs when considering professional wrestling and comic books. 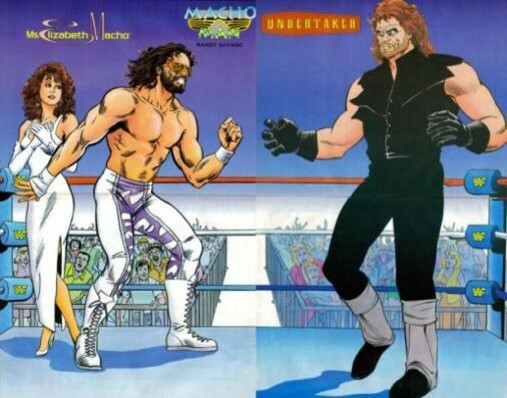 Various comic book publishers have created titles specifically to feature professional wrestlers, such as going back to the early 1990s, when Valiant and Marvel comics had different deals with the then WWF (now WWE) to feature the WWF wrestlers in established or new series, with some being more successful than others. More recently, Super Genius, a subset of Papercutz, released WWE Superstars, an alternate universe comic where the wrestlers are all versions of themselves, just not wrestlers (even though they know wrestling moves). To show that this relationship between the comic book industry and professional wrestling remains strong, Corey Graves, a ring announcer for WWE’s NXT, did a segment of his show, Culture Shock, at Marvel headquarters in New York City, where they discussed the convergences between comic books and professional wrestling. More importantly, however, is how the very nature of professional wrestlers means the characters they portray are hardly different from the characters seen in the pages of comic books. Both media feature characters that are larger-than-life, meant to embody archetypes more than actual people. These archetypes could be as basic as good (face) versus evil (heel), or are meant to represent different nationalities or ideologies, or could be different genre tropes or movie conventions. Comic book characters, especially those in superhero texts, are often characterized in the same, especially coming out of the DC Comics of the Golden and Silver Ages. Superheroes and wrestlers are supposed to represent the best and worst of humanity, and through their struggles we can learn something about ourselves. It is no surprise, then, that professional wrestlers will sometimes appropriate the tropes of superheroes in their performance. Thus has Finn Balor appeared, on the indies, wearing body paint to emulate various characters from the Marvel and DC universes, and the WWE has tried to create superhero characters from time to time, such as those seen below or their recent storyline pitting Stardust versus Neville. Furthermore, various wrestlers have demonstrated their fandom of superhero texts through their in-ring presence and out-of-ring activities. For example, Raven would wrestle in t-shirts depicting the various superheroes of which he was a fan, and Punk has recently worked with Marvel, writing on various titles like Thor and Drax. All of these convergences between professional wrestling, movies, and comic books is not simply because wrestlers enjoy those things or because those things are popular at the moment in the wider society. Indeed, the reason for such convergences are because of both those things, and because of something more: it is good business practice. By encouraging and relying on all of these convergences, and thus creating an intertextual experience, professional wrestling is able to create a polysemous text that contains something for almost everyone in the society or culture. If you like Mad Max and heavy metal, then there are characters for you. If you like superheroes and battles between good and evil, then there are storylines for you. If you like seeing movie stars, then there are wrestlers for you. In trying to reach the largest possible audience, having a text that appropriates from other texts, that creates an experience that is both convergent and intertextual helps you to do just that. This practice is especially important for the WWE, which needs to find, create, and maintain a large fanbase to pay for its existence. The more people you can appeal to, then the higher your ratings will be, and the more money you can make from merchandise. But the practice is important for any federation that needs to ensure it will have loyal consumers, aka fans, who will find something that interests them and keep coming back for that at least. I noticed this practice even in the small AAW promotion, as the variety of people in attendance were not what I expected. The fanbase of professional wrestling appears to be a more diverse and polyvalent audience than I had originally anticipated, given my stereotyped notions of just who would want to watch it. Overall, the reason why professional wrestling is convergent is because in doing so, they can draw in a larger audience, and that audience, in finding something that they are familiar with and like, will be able to find a reason to keep paying attention to and co-constructing the “reality” in the ring. People are more likely to participate in the building of the hyperreality if it is one they will like. The textual convergences here suggest ways in which professional wrestling relies on what people already like to further the creation of this hyperreality, this converging of the real and the fictional.